My memory started that afternoon. At the time i was a sacker at a Grocery Store, and was scheduled to work that night;however, I called in sick so I could stay with my cousin and watch Game 6. I was so excited and nervous, little did I know that I could`ve gone to work, come home and the game would still be going on, who knew? Anyway, I was with my Cousin, his friend and my nephew, When Hull scored I was so happy I cried, I`m not ashamed to admit I cried; it was the best feeling in the world. I was so relieved and so happy. The way our guys hung in there – fought – not once did I fall asleep, not even after midnight; I was so jacked up and nervous. It was after that that I gained a new respect for Goalie Dominick Hasek – for him to do what he did with the deadly firepower that we had and for him to stand up and literally stand on his head and nearly stop everything we threw at him. I took my hat off to him; he was a great goalie. definitely one of the best. But that night belonged to My Boys. I was never so proud of them as I was that night. I did attend the Victory Parade two days later. It was even more exciting (I`m sorry to say) than the 3 Cowboys victory parades I’ve been to. Go Stars. NOTHING ELSE MATTERS!! Hey, you’ve got a monkey on your back! It all began at the last game of the 2009-2010 season. It was depressing to know we were going to miss the playoffs for the second year in a row. Talking to friends in the corridor before the game I was reminded that today was the last day to use our gift cards. As a season ticket gift we were given $100 gift cards to use for concessions or merchandise but we had to use it before the end of the season. I had forgotten so in a panic I ran to the gift shop to use up the last of the money on the card. There was little options to what I could afford and not use my own money. I ended up with a Stars pillow and a stuffed Stars monkey. I always come up with a crazy bit to help make the hockey experience fun not only for me but the people around me. Unfortunately the past couple of years the play on the ice was not always easy to watch. As the 2010 season approached I had decided to put that stuffed monkey to use. The Stars had a “monkey on their back” having missed two playoffs in a row. As a reminder I had decided to wear the monkey for every home game following a loss. It was supposed to be a reminder that every point counts and we can’t be giving them away early. Late in the season the Stars were on a roll. They were in first place in the Pacific division and second in the West. They were the hottest team in the NHL heading into the Olympic break so people began to criticize me for wearing the monkey. We were at a watching party when someone told me it was a lack of faith on my part to wear the monkey after losses. I then declared that I was so confident in the Stars that I would wear this monkey on my back for every Stars event I attended until we made the playoffs. A few minutes later a camera crew from Fox Sports South West came up to me and asked if they could interview me about the Stars and the monkey. With the previous conversation on my mind, I again declared my intention, but this time on camera and it was broadcast to all my hockey family. 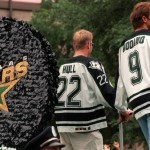 I also added that I was symbolically taking the playoff monkey off the Stars backs and putting him on mine. What harm could there be in this anyway? The Stars are killing the league and there aren’t that many games left. The last day of the season had arrived. Injuries to key players had created a total collapse for the Stars. Still after having lost several games in a row there was a slim chance they could make it. It hurt but, we needed Detroit to beat Chicago in regulation. Detroit had nothing to play for and could have easily mailed it in to rest players. Like true sportsmen they did not and they defeated Chicago just as we needed. The Stars only needed a win against Minnesota who they had beaten three games in a row. However, the Wild didn’t mail it in either and handed the Stars a season ending loss. The first message I received was from my ticket rep. He wanted me to know how sorry he was that I had to wear the monkey for another year. We missed the playoffs by one point and so the monkey lives on and on and on! Months in to the second year of the monkey I began to get tired of telling little children that they could not have my monkey. I had a drunk woman try rip it off my neck run off with it. I’ve even had people try to buy it from me. That is when one day I saw them at a dollar store. 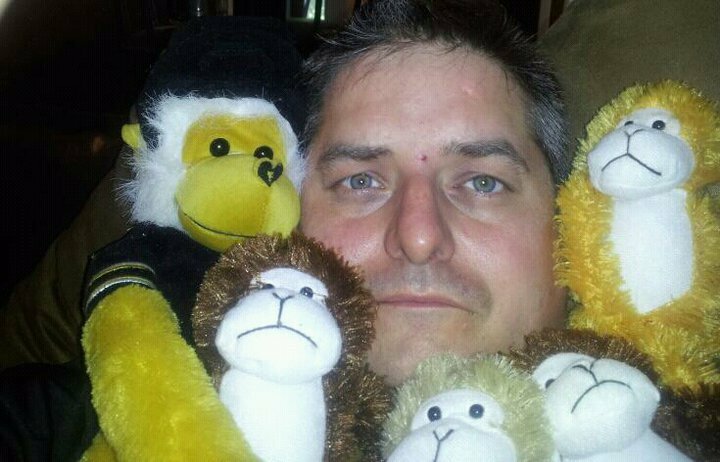 I decide to buy these stuffed monkeys to keep people from my monkey. I’ve also learned that giving a gift that makes a child’s day is worth far more than the dollar I spent on the monkey. Many tell me how cute and how great the monkey is. When I tell them I can’t wait for the day that he is gone then they get confused. I’ve been asked if I don’t like wearing him, why don’t I just stop. They also think it is superstition that drives me to continue to wear him. They say it’s been so long maybe he’s bad luck and so I should stop. Why then do I continue even if it goes on another year? It’s simply that I gave my word. I do my best when at all possible to keep it. I’m not always successful but I try even in small things. Don’t get me wrong I don’t hate the monkey or the fun I have with him. I’ve actually grown attached to the little thing. I just hate what he represents. Playoff hockey is the greatest thing to me in sports and every day I wear that monkey is another day away from greatness. When that day does arrive I ask that you celebrate with me as I have that monkey removed and we return to the playoffs.